Go to original pattern for design DROPS 186-10. 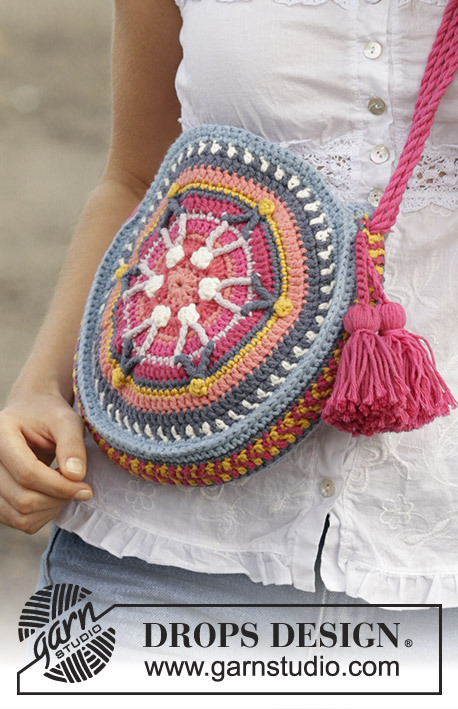 Crocheted bag with stripes, worked in the round from the middle and outwards. 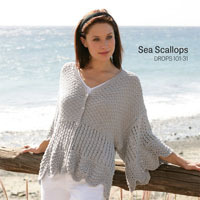 Piece is crocheted in DROPS Paris. NOTE: Bag worked with one color = 200 g Paris. DROPS CROCHET HOOK size 3.5 mm/E/4 - or size needed to get 18 double crochets x 10.5 rows = 10 cm / 4'' in width and 10 cm / 4'' vertically. See diagrams A.1 and A.2. (A.2 shows how round begins and ends). 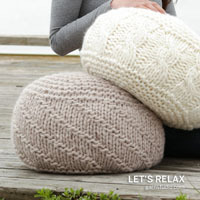 When switching color at the beginning of a round, work slip stitch at the end of previous round with the new color. When working with 2 colors on a row work as follows: Work last double crochet with first color but wait with last pull through, switch to next color and work last pull through, then work next double crochet. 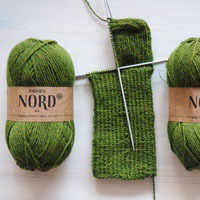 When working with two colors on a round place strand for the color not worked over stitches from previous round, work around the strand so that it is hidden and follows in the round. ROUND 13: * 1 double crochet with dark wash, 1 double crochet with off white *, work from *-* the entire round. the side of bag back and forth. Then work the side and circles together. Work 6 chain stitches on hook size 3.5 mm/E/4 with apricot and form a ring with 1 slip stitch in first chain stitch made. Work STRIPES (circle) and COLOR PATTERN - see explanation above and pattern A.1 6 times in total on round (A.2 shown how round begins and ends). REMEMBER THE CROCHET GAUGE! round = 12 quadruple double crochets and 5 single crochets between each. ROUND 9: Work 1 chain stitch, * 1 single crochet in each of the first/next 14 double crochets, 2 DOUBLE TREBLE CROCHETS TOGETHER - see symbol explanation *, work from *-* 6 times in total (work last double treble crochet around first quadruple double crochet on round), finish with 1 slip stitch in 1st chain stitch at beginning of round = 6 double treble crochet together and 14 single crochets between each crochet together. 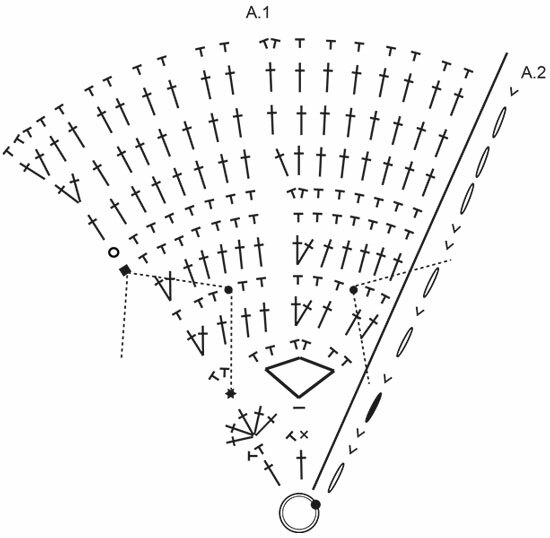 When entire diagrams A.1 and A.2 have been worked, there are 120 single crochets on round and piece measures approx. 20 cm / 8'' in diameter. Fasten off. Work another circle the same way. ROW 1: Work with spray blue: 1 chain stitch to turn with, work 1 single crochet in every chain stitch (= 78 single crochets + 1 chain stitch). ROW 2: Work with dark wash: 1 chain stitch to turn with, work 1 single crochet in every single crochet. ROW 3: Work with heather: 3 chain stitches to turn with, work 1 double crochet in next single crochet, 1 chain stitch, skip 1 stitch, * work 1 double crochet with mustard in next single crochet, 1 double crochet with heather in next single crochet *, work from *-* until 2 single crochets remain on row. 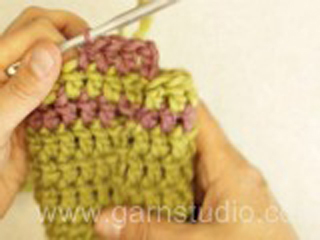 Switch to mustard and work 1 chain stitch, skip 1 single crochet, 1 double crochet in last single crochet. Thread the twined string through hole in each side later. ROW 4: Work with heather: 3 chain stitches to turn with, work 1 double crochet in next double crochet, 1 chain stitch, skip 1 chain stitch, * work 1 double crochet with mustard in next double crochet, 1 double crochet with heather in next double crochet *, work from *-* until next chain stitch on row. Switch to mustard and work 1 chain stitch, skip 1 chain stitch, 1 double crochet in last double crochet. Thread the twined string through hole in each side later. ROW 5: Work with dark wash: 1 chain stitch to turn with, 1 single crochet in every stitch (work 1 single crochet around the 2 chain stitches on row). ROW 6: Work with spray blue: 1 chain stitch to turn with, 1 single crochet in every single crochet. Cut the yarn. Work along one short side with spray blue as follows from right side: Fasten strand with 1 single crochet, work 3 chain stitches, work 7 double crochet along the edge. Work the same way along the other short side. Fasten off. Use spray blue to crochet together. Now work the parts together through both layers in last round on circle and last row on the side of bag. Place the 2 parts together, wrong side against wrong side. Work from right side and begin with circle towards you: * Work 1 single crochet in first/next single crochet on circle and around the side on outermost double crochet (worked in one end on the side of bag) *, work from *-* 3 times in total (i.e. there are 3 single crochets around same double crochet and 1 single crochet in the first 3 single crochets on circle), then work 1 single crochet in next single crochet on circle and first/next single crochet on the side of bag. Work like this until next double crochet in the other end on the side of bag. * Work 1 single crochet in next single crochet on circle and around the side on outermost double crochet (worked in the other side of bag) *, work from *-* 3 times in total (i.e. there are 3 single crochets around same double crochet and 1 single crochet in each of the next 3 single crochets on circle). 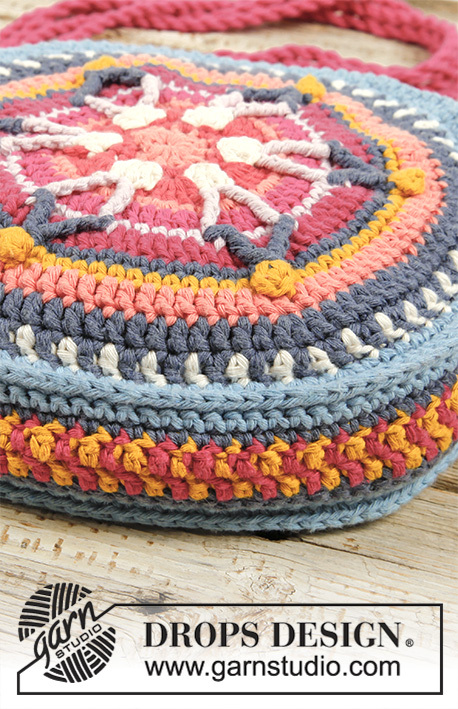 All stitches along the side of bag have been worked, and 36 single crochets remain on circle. 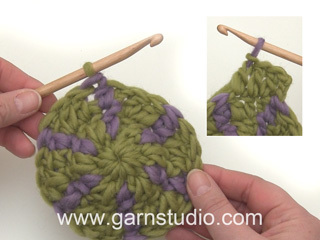 Continue with 1 single crochet in each of the remaining 36 single crochets on circle. Fasten off. Work the other circle to bag the same way but now work in the first chain stitch row worked on the side of bag. NOTE: Make sure that the 2 circles are placed symmetrical to each other, so that the pattern is the same in both sides of bag. Cut 4 lengths of 2 metres each. Twine the strands tog until they resist, fold the strands double so that they twine. Make a knot at each end. Make 3 more twined strings = 4 twined strings. Thread 2 strings from the outside and through one of the holes in one side of bag. Tie a big knot to fasten the strings on the inside of bag. Repeat in the other side, and fasten the last 2 twined strings the same way in the 2 other holes. Make 1 large and dense tassel in each of the colors shocking pink and heather. Cut 60 strands 18 cm / 7'' long, tie one string (approx. 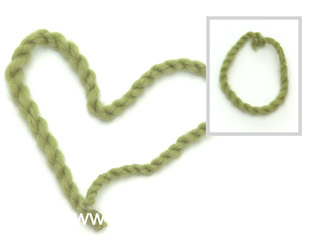 20 cm / 8'' long) around the middle and fold the strands double at the knot, wrap a new strand (approx. 20 cm / 8'' long) 3 times around all strands approx. 2 cm / 3/4'' down from the middle. 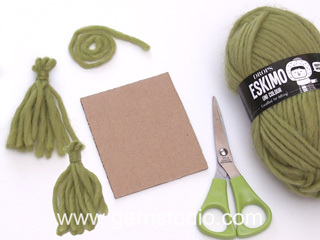 Tie the strand and insert strand into tassel, cut the yarn. Crochet with 2 strands as follows: Fasten strand with a single crochet around string at the top of tassel, work chain stitches for 6 cm / 2 3/8''. Cut the yarn. Make the other tassel the same way. 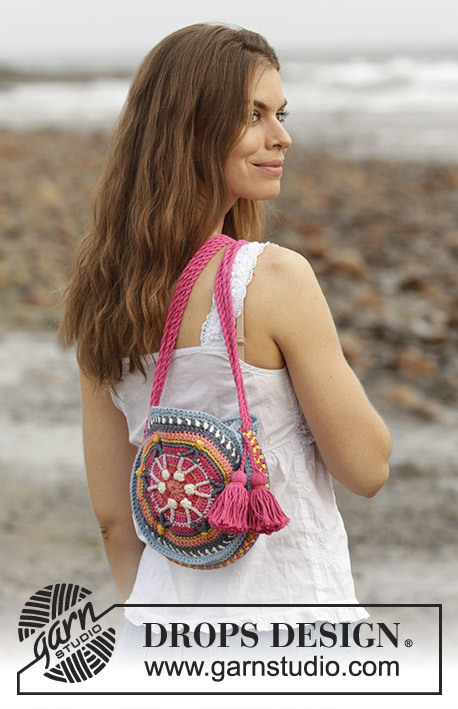 Fasten tassels to one side of bag by threading the chain stitch row through the bag and tie a knot. = 1 single crochet in stitch (insert a marker in this stitch to make it easier to see when this is worked in this single crochet on 4th round). = work QUADRUPLE DOUBLE CROCHET: Make 4 yarn overs on hook, insert hook down and around single crochet to be worked, get the yarn, * 1 yarn over on hook, pull yarn through the next 2 loops on hook *, work from *-* 5 times in total = 1 loop on hook. = Work 2 DOUBLE TREBLE CROCHETS TOGETHER: Work 1 double treble crochet around first/next quadruple double crochet from 7th round, but wait with last yarn over and pull through, work 1 double treble crochet around next quadruple double crochet the same way, but now pull last yarn over through all loops on hook = 1 double treble crochet. 1 DOUBLE TREBLE CROCHET: Make 3 yarn overs on hook, insert hook down and around first/next quadruple double crochet on 7th round, get the yarn, * 1 yarn over on hook, pull yarn through the next 2 loops on hook *, work from *-* 4 times in total = 1 loop on hook. = work BOBLE: Work 2 treble crochet and 1 single crochet into 1 stitch as follows: Work 1 treble crochet but wait with last yarn over and pull through, work 1 more treble crochet the same way, work 1 single crochet in same stitch but now pull last yarn over through all loops on hook = 1 stitch.